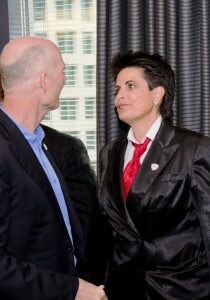 On May 16, 2012, Linda Webb AKA The Fraud Dog, had the pleasure of meeting and speaking with Florida’s Governor, Rick Scott. Being a leading fraud expert, Webb thanked Governor Scott for the State of Florida’s compliance investigators who work relentlessly in ferreting out businesses who misrepresent the number of employees working, skirting the system and paying cash to avoid insurance premiums. Workers compensation fraud hurts everyone in Florida, as the state does not get it’s unemployment taxes. Working in conjunction with the Department of Financial Services state enforcement agencies, together we can stop fraud. Fraud continues to morph in all consumer areas, but fraud awareness and educating the public to report fraud well help, says The Fraud Dog.